Brooklyn 11211 › What’s Going on at 65 Commercial? What’s Going on at 65 Commercial? A few weeks ago, all of the powers that be in North Brooklyn seemed to be aligned behind a single vision – getting the MTA to live up to its commitment to get out of 65 Commercial Street. Now, any deal to turn 65 Commercial seems about to founder on the rocks. 65 Commercial Street is the MTA property in north Greenpoint that was rezoned to parkland in 2005. As part of the agreement between the City Council and the Mayor’s office to allow the zoning to go forward, the Mayor’s office got the MTA to agree to give up the property in exchange for comparable land nearby. For almost 6 years now, the MTA has been dragging its feet, claiming the land swaps offered by the City weren’t comparable and generally doing anything they could to not live up to their end of the bargain. Local politicians, especially David Yassky and Joe Lentol, pushed the City and the MTA to come to an agreement and turn this property as parkland. Steve Levin, who succeeded Yassky in 2010, took up the banner and kept the pressure on. Just last month, District Leader Lincoln Restler organized a protest at the site that drew renewed attention to the issue, and included the support of Congresswoman Nydia Velazquez. 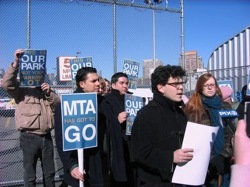 Levin and the Mayor’s office, meanwhile, were pushing the MTA behind the scenes, and finally, in January, the MTA agreed to a series of swaps that would finally start the process of turning 65 Commercial into a park. The first swap was that the MTA would take about 42,000 square feet of former parkland under the Williamsburg Bridge, between Wythe and Berry, as the new location for their emergency response vehicles (ERVs). This aspect of the deal seems to have been in place for some time (I had heard about it going back at least a year, if not much longer). The sticking point all along was where to put the MTA’s 150 or so Access-a-Ride vehicles. Finally, in January, the City reached a deal for the MTA to take a block of property in Maspeth for these vehicles. So now we have the structure of a deal in place, and all of the local pols on board – problem, solved, right? No. It appears that the deal – and Greenpoint’s future park – is in jeopardy from two different directions. First, at this week’s CB1 meeting, Velazquez staffer Evelyn Cruz announced that the Congresswoman is opposed to BOTH land swaps (both of which are to (and from) sites in her district, so these are issues that she should weigh in on). The Maspeth site for the Access-a-Ride vehicles is in an area that is zoned and used for heavy industry. The vehicles are already traveling through the district, and many will continue to travel through CB1 as well. So the distribution of burden there is shifting slightly, but all within an area that already has the burden. Yes, it would be ideal to get the vehicles out of our lives for good – less traffic, less pollution, less congestion for both Maspeth and Greenpoint – but shifting the burden a mile or so away, to an area that is zoned for such a use, seems reasonable given that where the vehicles are located today is zoned for parkland. In other words, don’t throw out the good for the perfect. And focus on the real problem, which is where the second monkey wrench comes in. This one is coming from the Mayor’s office, and it concerns the second land swap – putting the ERVs on a former playground site underneath the Williamsburg Bridge. If the City gets it way on this, it would basically screw over the Southside in favor of Greenpoint. The Berry/Wythe site under the Williamsburg Bridge once held a playground, and it is still zoned for parkland. But the playground was closed in the early 1990s because paint stripping on the Williamsburg Bridge was covering the playground in lead-paint chips. At the time, the City agreed that the park would be reopened after reconstruction on the bridge was complete. Instead of a substandard park inland, the Southside could get real waterfront access, a larger waterfront esplanade and substantially more open space. For a neighborhood that has one of the worst ratios of per capita open space (a ratio that will drop when Domino gets built), this would be a huge step forward. Because the Berry/Wythe site is mapped as parkland, the City can’t just take it away – under State law, it has to provide comparable new parkland to offset the loss of this parkland. As I noted above, swapping Berry/Wythe for the DCAS/DOT site would to just that – and more. The neighborhood – the immediate neighborhood – would get more and better parkland, open space, recreation space, in the process reinstating park space that was lost almost 20 years ago and making up for some the reduction in per capita open space from the huge rezonings of the past 6 years. Win-win. But what the Mayor’s office is saying is that the new park space at 65 Commerical Street – all the way up in north Greenpoint – is the offsetting open space. Remember, 65 Commercial was promised as incremental park space as part of the 2005 rezoning – specifically to mitigate the impact of all the new residential development. The Berry/Wythe parkland should have been part of the baseline that 65 Commerical added to. The City committed to replace that parkland years before the rezoning was even a glimmer in anyone’s eye. To now say that 65 Commercial is Berry/Wythe is a cruel bait and switch that ultimately pits the open space interests of Greenpoint (a community that is sorely lacking for open space and a publicly-accessible waterfront) against the Southside (a community that is sorely lacking for open space and a publicly-accessible waterfront). The Williamsburg Bridge site is a reasonable place to relocate the ERVs, and Velazquez should support that. The City has made commitments both to Greenpoint (65 Commercial) and to the Southside (reopen Berry/Wythe), and if it is going to close Berry/Wythe, it has a legal obligation to replace that parkland. What every local politician – our Congresswoman, State Senator, Assemblyman, both Councilmembers and our district leader – should be fighting for is an equitable land swap that benefits both the Southside and Greenpoint. Giving up unused, unlit parkland beneath the Williamsburg Bridge is a smart way to do that. Pushing for a good deal on 65 Commercial, even if it means keeping Access-a-Ride vehicles in the district, is also a smart way to do that. Again, we’re in danger of sacrificing the good for the ideal – let’s not go there.